I have books. It’s been an excellent specimen of a week. Seriously, it was getting a bit scary there for a minute, with my TBR down to 4 books I didn’t feel like reading…and then I went op-shopping (thrift-storing/ secondhanding) with my mum and sister. I found BOOKS. No clothes, obviously. But so many books. I let out strangled gasps of afjkdlfasd when I found Skulduggery Pleasant books — UNREAD AND UNMARRED — and basically whispering my name. I adopted them immediately. Also, incredibly, one of my mum’s friends (who is a famous food blogger) shared one of my posts and my blog had 3,000-page-views in ONE DAY. I-I-I am so amazed and excited and just wow. (I usually average around 700.) SO THAT HAPPENED. So, yes, quite a lot, but I haven’t had new books in weeks. THE THIEF LORD: It was, like $2, at the op-shop. It’s Cornelia Funke. WHY WOULD I SAY NO? MESSENGER (The Giver #3): Did you know The Giver is a quartet?! I read book 2: Gathering Blue ages ago, but finally got around to book 3. The cliffhanger was RIDICULOUSLY CRUEL. GRAVE MERCY: For my book club! Assassin nuns, peoples, that’s all I can say. ME, EARL, AND THE DYING GIRL: Because it’s going to be a MOVIE. THE YOUNG ELITES: Again, I’ve wanted this forever BUT I’M RIDICULOUSLY EXCITED AND REMEMBER EXACTLY WHY I WANTED IT. It’s about villains. ‘Scuse me, I need a moment to flail. VALIANT (book 2): I love Holly Black and I’m slowly collecting this trilogy. Backwards. Yup. I have book 3 (bought for 10 cents), and now book 2 (snagged second-hand for $4)…finding book 1 would make my day. THE UNLIKELY HERO OF ROOM 13B: This was incredible. Like, mind-blowingly incredible. Comics and OCD and the sweetest sibling relationships ever. Thank you Walker Books for the ARC! SHH! : I won this from the author, Stacey Nash! YAY. 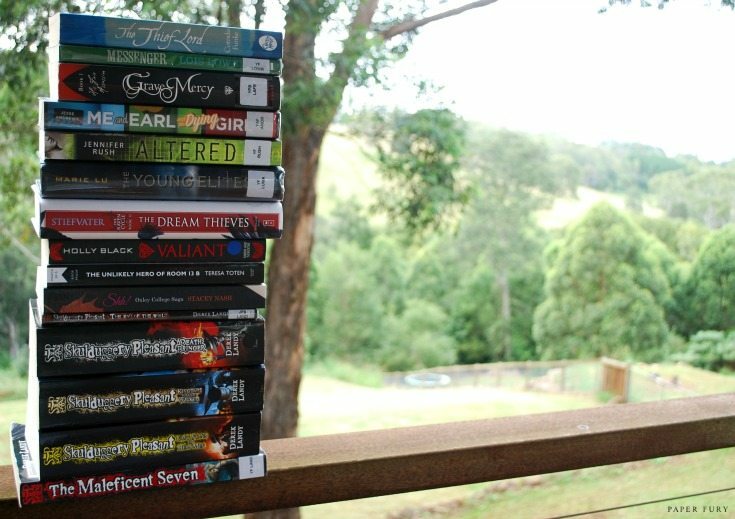 SKULDUGGERY PLEASANT: I bought Death Bringer (6), Kingdom of the Wicked (7) and Last Stand of Dead Men (8) from the op-shop (and totally flailed irrationally when I found them…what is breathing? i forget) and from the library I borrowed, The Maleficent Seven (7.5) and The End of the World (6.5). The end of the world? So many books? Highly anticipated glorious papery wonders? PROMISES OF DESTRUCTION? I am so happy. SUNDAY: I detail the delicious adventure of making hot cross buns with preschoolers. MONDAY: Basically Half Wild by Sally Green was so fabulous. And oh look there is my heart bleeding on the ground. FRIDAY: I review As White As Snow (woah, apparently it’s review-all-the-sequels-week on my blog) and it sadly didn’t live up to book 1. There’s a trailer out for Me, Earl and the Dying Girl which…I HAD NO IDEA WAS BECOMING A MOVIE UNTIL JUST NOW. So, yeah, I have the book. I’m going to catch up ASAP. While we’re talking about movies, have you seen this featurette for Age of Ultron?? I’m…kind of starting to FREAK OUT WITH INCREDIBLE FANGIRLING, OKAY?!! Starflight by Melissa Landers has a new GORGEOUS cover. I want it. Katie @ The Goodness Revolt says we don’t have to be creative all the time. I nearly sold out my Etsy store this week (which is a phrase I LOVE to say) so I’m preparing to post some trilogy book-necklace collections. What do you think?! And, honestly now, what are the logistics of wearing all 7-Harry-Potter books at once? Hmm? Can we make this work? WELL (obviously) I’M AN AUNT AGAIN!! If you recall from my Hot Cross Buns post, I mentioned my incredible-large-with-child older sister (who blogs, by the way). It was a girl (!!) and she’s been named Juniper, which is an incredibly adorable name even though my brain refuses it and I accidentally always call her Jupiter. Whatever. She’s soft and squishy and adorable. I officially have 4 nephews/nieces…and it’ll be up to 6 by the end of the year. Pity me, please, at Christmas time. ALSO! Walden Media favourited my tweet about reading Messenger (The Giver #3) and…let’s just say, I’M FAMOUS AND FABULOUS. Previous Post: « Why Is There So Much Sexism in Epic Fantasy? WHY? Ooooh, what an adorable niece. I had a lovely week, and one three hour exam is out of the way. Mission accomplished! Your niece is adorable, as are most small babies. I go a ridiculous number of ebooks this week from entering a compettion. You can get good (though older) secondhand books in Dehli, which is where I got Skulduggery from. I would love to see your thoughts on the young elites, because I love Marie Lu and I haven’t read it yet. was it the Spring Fling competition?! Because I won SO MANY EBOOKS from them. :O I'm a little nervous though, because most came with emails asking for reviews and I didn't want to feel beholden to review them. *gulps* So. many. books. to. read. I’ve just read The Giver and the whole premise of the book was amazing. I read it on Kindle (so if I’d like it I’d just buy the whole quartet to save a little money and having double copies) and it let me read a sample of the next book which I did but it didn’t mention Jonas or anyone from the previous book at the start so is it the same characters or is it a completely different story? Ah, yes, Book 2: Gathering blue TOTALLY disappointed me because it wasn't even about Jonas. It is a completely separate story, but then book 3 ties book 1 and 2 together. XD If that makes sense. Enjoy your new books and yay for famous accounts favouriting things! Aww, your niece is gorgeous!!! Congratulations on being an aunt (again!). And your haul is just so amazing, I don’t even know where to start in admiring it! I read The Thief Lord a few years ago, and I liked it so, so much. I’d definitely recommend it! Hope you enjoy all your new books, and have a lovely week. I seriously can't wait to start The Thief Lord. XD I'm on a real fantasy-kick at the moment, too, so I'm perfectly in the mood for it! The Young Elites is pretty decent YA high fantasy. Some elements I didn’t like. But the epilogue sets up some good things for the sequel. I've JUST started it!! So far, I'm a little dubious. I didn't actually realise it was going to be medieval-ish. I thought it was modern. >_< GAH. I should read blurbs…. Your niece is so cute, and I love her name! Also, yes, I buy second hand books a lot because they are incredibly cheap, and I can often find them in a condition that’s not new but new enough. It’s actually my favorite way to get classic books, because I find used classic books more often than I find used modern books. Cheap books = happy me. I LOVE new ones and I want to support authors, but omg, I'm a poor starving artist and I have to do what I can do. ha. Classics are very plentiful second hand. *nods* I've noticed that too. Oh yes, I HAVE read Son. It was so incredibly good. It did resolve most of the issues, but there were still a few things that I wasn’t happy with. Your new niece is so cute!! I REALLY NEED SON. OMG THE CLIFFHANGER IN MESSENGER IS HURTING ME. THE THIEF LORD IS SUCH AN AMAZING BOOK. It’s been a school reading of mine and one I enjoyed immensly (I’ve read it before). It’s such a nice story and so pretty written and the movie adaptation is one of the best. But then, I’ve read it a few years ago when I was about 12 or 13 and loved it. No idea if it’s as good when one is older. I hope so, though. Aw, cute niece. I’ve become an aunt again as well. She’s three weeks old today. Congratulations on becoming an aunt again! I’m sure you’ll remember her name eventually! You got some great books too! I read The Thief Lord a while back and I remember much preferring the Inkheart books but, then again, it’s Cornelia Funke so you can’t really go wrong. The Skulduggery Pleasant books are good fun too. Derek Landy is one of the few Irish writers to make some headway into YA so that’s always great to see, being Irish myself. I was actually at a book signing of his back when the third book came out and he was pretty fun. I think I was about 10 at the time so I don’t remember too much but he was great, and I got some of the books signed too! I HOPE SO. Gah. I actually focused very hard and called her Juniper once. ONCE. *facepalm* I've actually, embarrassingly, only read one Cornelia Funke book so I'm quite excited to try something apart from the Inkheart books. (I do so need to finish that trilogy though.) SKULDUGGERY PLEASANT IS MY LIFE. I absolutely laugh my head off at the witty dialogue. xD Zomg, you are so lucky. I would a) love to see Ireland, and b) love to meet Derek Landy. Are you going to read his Demon Road book when it comes out?! I actually had no idea that he had a new series starting, but now that I’ve heard I’d say I’ll probably try it out. I actually haven’t read any of his books in two or three years but I’ll definitely be interested. Thanks for letting me know! Also, if you ever consider visiting Ireland, bear in mind that this is the country whose government accidentally made LSD, ecstasy, meth and loads of other drugs legal for three days (that happened last month). Yay to baby niece!!! How exciting and awesome. Soo cute and love her name. Congrats on the epic pageviews and awesome book finds. Seems you had a fab week!! 3,000 views? That’s awesome, girl! ;D and look at those booooooks. I totally didn’t know that Me, Earl and the Dying Girl was going to be a movie!! I didn’t enjoy The Young Elites as much as Marie’s Legend trilogy. 🙁 I need to get The Dream Thieves myself soon! I already read The Raven Boys and need to get on with this series already. I buy a lot of secondhand books-I troll the charity shops looking for new series and authors to try and my unwanted books go to charity shops if I can’t trade them. It’s my way of making donations to the charities. I always SAY I’m bad when I buy books when I should be on a book ban (like now) but if I’m honest, I don’t care coz I LOVE buying books!!! Baaaad chuckles…! BOOKS ARE TOO AWESOME. And hey we could have worse collections, right?! We could be wanting to collect….decorative pizza cutters. BUT WE ARE EPIC AND COLLECT BOOKS. yes yes YOU HAVE TO. Although even if you don't like the first few books YOU MUST KEEP READING. I was pretty “meh” about books 1 and 2 but after that….zomg. Addicted? I think yes. The humour is just golden. *whispers* I'm nearly finished The Young Elites now. I…I'm having issues. So this actually makes me feel better. XD It's not as spunky as I expected and the villainous vibe isn't scary. Ooh, that looks like a beautiful copy of The Thief Lord</i. Have you really not read it yet? I haven't even finished the Inkheart trilogy. I AM BAD. Thanks for telling me Me, Earl and the Dying Girl is becoming a movie! Oh my. First of all YOUR NIECE IS SO CUTE. SHE IS BEAUTIFUL! Aww, congrats to your sister. Babies are awesome! And wow, what a great week! Congrats on sky-rocketing through the roof with 3000 views per day (?!) and the tweet from Warner Media (I think they recognised how awesome that phrase is…). ALSO: the trailer for me, earl and the dying girl IS SO COOL. I want the book and I want the movie. Only 3K tweets for one day. XD It's back to normal now *cries a little* lOL I AM JUST KIDDING. But it was an epic milestone! AHEM. So yes, Warner Media is officially the most awesome. Congradulations on being an aunt (again)! Juniper is a pretty name, I really like it. And those necklaces look amazing…how do you manage to make the tiny little covers? The Young Elites was good, I liked it. But then, it was also like 2 AM when I started reading it (i finished around 5), so I don’t actually remember anything about it, I just remembered that I liked it. That stack is impressive! I would also be super impressed if that stack didn’t fall between photos. I have wanted to pick up Me, Earl, and the Dying Girl for some time, but seeing that awesome trailer when it was released has definitely made me want to pick it up quicker! Great haul! Finding used books is always so exciting! You need to read The Young Elites right away! The protagonist is an anti-hero and it’s glorious. There needs to be more books about villains! OH jeez that’s a lot of books HOW DID YOU READ SOME OF THEM ALREADY. And how did they not topple towards the ground. Also The Thief Lord is good, but I read it back in elementary school so I mayyyyy be a little biased here. Oops. OH WELL. I see a lot of awesome things happened in your life! AND I LOVE THE NEW HEADER THINGS. I’m surprised that Messenger had such a big cliffhanger because the fourth book didn’t come out until recently, which is YEARS later. It’s a good thing you didn’t read it when it first came out! But who are we kidding, right–readers love torturing themselves with awful cliffhangers. It makes them feel all giddy and twisted inside. Sounds like you had one awesome week. That’s a LOT of new books, which is le awesomeness. 🙂 And I do pity you at Christmas time — My only sib is almost 7 years younger than me, so here’s hoping I don’t have any nieces/nephews for quite a while. Dorothy Must Die was recently added to my TBR — that cover w/o the dust jacket is really neat; and yes, really creepy. Thanks for sharing! It was pretty spectacular. *dances* XD Ha! But gosh, yes, I hope you don't have nieces/nephews for a while. 😉 I have 4 older siblings and 3 of them have (or are having) kids so, yaaay for me. Except at Christmas time. When I'll be broke. *gulps*Agh, yes, EXACTLY THAT to Grave Mercy. It was a let down after the awesome premise. So many books!!!! Also, that picture of you with your new niece is absolutely adorable (I love babies)! I am not an aunt because my sister is 16 so…. But I am an old cousin. I have a little cousin who is four years old and he is adorable. Also, all my other cousins are older than I am so they all have wives and kids so I have lots of… cousins-once-removed? I really need to go thrift shopping for books and clothes. Being in college gives me a new perspective on money. It’s true that instagram makes the pictures so huge. I tried messing with it but I couldn’t change the settings. Oh well. Huge is good. OOH I have a genius idea for the HP minibooks! What if you make the first one and the seventh one earrings, and then you can have five on a chain instead of all seven. THERE. The girls are the strong ones in our family. *nods* I only have one brother and a TON of sisters and a lot of girl cousins. Most of my second-cousins are boys though, so my family is mostly balanced? HA HA EXCEPT WE'RE ALL CRAZY. Ahem. What was I saying? (Zomg, ignore me, it's late and I'm loopy. )I love cheap books, I mean, it doesn't support the author but i AM A POOR BOOKWORM. Life is expensive, seriously, shheeeesh. HA THAT IS AN EXCELLENT IDEA FOR THE HP SET. omg, that would look so epic right?! And a bracelet. Then I could have like 2 for earrings, and 2 for necklace and 3 on a bracelet. *plots* DID I EVER MENTION YOU'RE A GENIUS? Look at that – I’ve given you TWO WHOLE GENIUS IDEAS in the last… month? I KNOW RIGHT?! Gee. I just need to hang around you like all the time. I AM SO JEALOUS OF YOUR BEAUTIFUL BOOK STACK. THAT IS AWESOME. I looove buying books second-hand, especially at library sales. There is also an awesome second hand book store that I NEED TO GO BACK WITH BOOKS TO GET CREDIT THERE AGAIN BECAUSE WONDERFUL BOOKS. I also saw White Cat there and died and almost got it but was stupid and didn’t because it was expensive. CLEARLY SOMETHING IS WRONG WITH ME. Congrats on another niece! Being an aunt sounds like a lot of fun. For Instagram, I usually use this app called Instasize. I think it’s free, but sometimes there are advertisements on it. -__- Advertisements on an app sounds weird to me, but apparently people do that. I'm reviewing it tomorrow (?! I think? Gah who knows what I schedule. It's usually a surprise to me as well) AND IT IS JUST SO CUTE AND INCREDIBLE AND HEARTBREAKING. But not as sad as a lot of the contemporary/mental-illness YA books these days, so that was a relief. XDI shall look up instasize. THANK YOU. WHAT HAVE YOU DONE?! I now have to read that Earl book. It’s been on my TBR for eons but now I have to make it nr 1. I must. I must. Congrats on your new niece! I don’t have any nieces or nephews. I’ve only got one sister, and I don’t think she’s planning on having any kids. But I’ve got lots of… first cousins once removed? (Children of my first cousins.) I already have 17 of those (I think… I’m starting to lose track), and there are 3 more coming in the next few months! Whew. Family titles get complicated right. 0_0 I know what you mean…are they second-cousins? GAH. I DON'T KNOW. I have lots of second cousins too that are quite young. Woah, though, that is a lot! you have a busy family. ;-)Ooh, yes, that would be awful of the second-hand books smelt. I DON'T LIKE WEIRD SMELLS. Lucky for me, I've only ever gotten average bookish-smelling 2nd hand books. Congrats on being an aunt again! I learned that my brother and his wife are expecting this later this fall. That will be 6 more me by the end of the year as well. Grave Mercy has been on my TBR list for like EVER! I did pick up a uber marked down copy before the end of 2014. Assassin nuns was the selling point for me when a bookseller was telling me about it when it first came out. CAIT WHY ARE YOU DOING THIS TO ME. The new Avengers movie has already taken over my blog and my twitter, and I’m sure it will continue to do so for the next weeks. I carefully repressed my excitement the last two years and only let it out during random periods of rewatching the movies, because I knew I wouldn’t be able to handle the wait otherwise BUT NOW THE RELEASE DATE IS SO CLOSE AND I CAN’T. I’m basically just sitting here, waiting to spontaneously combust from excitement. DID I MENTION I’M EXCITED YET. Aaaaaanyways, congrats on the tiny human and the books. I can’t wait to see what you think of The Young Elites. I’m always curious about an antihero storyline! OMG CAIT. YOU ARE GOING TO LOVE THE YOUNG ELITES! Especially considering how you are with books about villains. 😉 This is going to be right up your alley, and I can’t wait to see what you think of it when you finish. Thanks for sharing, and happy reading! FAJDLKFASD I LOVE VILLAINS. THEY ARE MY LIFE. That stack of books is GLORIOUS. I don’t even know what else to say. Because… so pretty. I need to read Me and Earl and the Dying Girl too. Because it is a movie. I will read just about anything when someone says they’re making it a movie. I don’t really know why. Also, I have owned it for like, a year and a half. So I voted that you should read it, of course! Me, Earl and the Dying Girl, 13B and the Young Elites are all on my TBR list, so I’m excited to hear what you think. You know, I’ve also had Altered on my shelf for a while and cannot remember why either…. Hmmmm. I wonder. Congrats on you new niece! I have 3and 2 nephews and I’m always buying things for them year round. At Christmas I go broke but I wouldn’t trade them for the world. 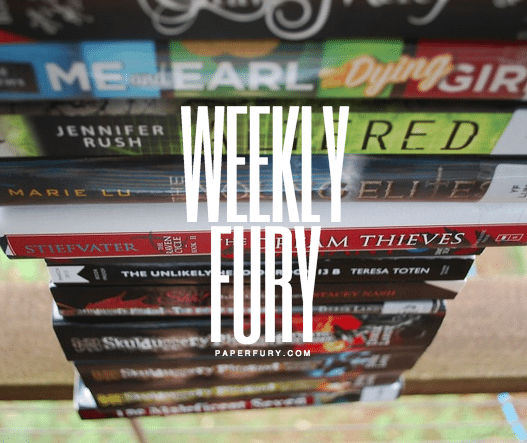 Lots of pretty books this week. Enjoy!! I KNOW RIGHT?! I love being an aunty and I whinge about Christmas buuuuut gah, I don't mean it. xD They're so epic. AAAH congrats on the new minion-to-be! I totally missed that on Instagram this week! Also, that's a huge pile you have! I haven't read any of them, sadly, but I'm planning on reading The Young Elites since I love the Legend trilogy. I love your blog. I think I have been here a few times but just never followed, my bad. I am now following 🙂 Me, Earl and the dying girl OMG it looks amazing!!! I want the book and to see the movie!! Congratulations on being an auntie again 🙂 Happy Reading! Sounds like you’ve had quite a week! I never think to look at books at thrift stores but I can see I’m definitely missing some opportunities! Congratulations on your niece and have a fantastic week! You AVERAGE 700 a DAY?! GIRL, YOU ARE FAMOUS. Seriously. I’m lucky if I even get 300 in a day! :)) you’re truly an inspiration to us all, Cait 😉 Please, teach us your ways! Hope you have a fabulous week ahead, Cait! Congratulations on the birth of your niece! You definitely need to read the Young Elites and Dorothy Must Die as soon as possible, both were books I though I wouldn’t like but ended up really enjoying. Your book stack is as tall as mine. I had to break it up in to two pictures! Wow! 3K views in one day is staggering for us poor (literally, books are expensive) book bloggers. You are so lucky in your book finding! I have yet to find a decent YA book at the thrift store. Maybe I just shop at the wrong thrift stores, or maybe you’re a much better spine spotter. (I like that alliteration. That should become a thing.) I’ve read The Thief Lord, but I didn’t love it. Have you read it? Me, Earl, and the Dying Girl looks so great! I can’t wait to read it, and watch it when it comes out. Also The Unlikely Hero looks SO GOOD. I must gobble up that book! Is it out yet for people that don’t have special ARC status? All in all, it looks like you had a really fantastic blogging week! BABY!!! I SHALL CALL IT SQUISHY AND IT SHALL BE MINE AND IT WILL BE MY SQUISHY!!! Newborn babies are the best… especially when you can hand them off to their moms when they are anything but adorable. And the name is great! Wow that is some stacking! I voted for your next choice too.. Thank you so much for visiting my post. You niece is adorable! 🙂 I love the name Juniper (and Jupiter). It’s so unique. I've checked out our local op shops once or twice looking for old classics (still hoping to find an early edition Alice in Wonderland for my collection, but alas, no luck), but all they seem to have are old tatty bodice rippers. No thanks. You're local one sounds incredible, lots of bargains. And who needs clothes when you have books anyway? Just fashion yourself a lovely book ensemble, you're an Etsy seller, you people are the Macgyver of crafts. OH HECK YES. I need a paper dress. I just truly do. And provided it doesn't rain, I should be good to go. AW, YOU ARE SO NICE. That's the first time I've been accused of being photogenic. 😉 It's the baby that's the cutest little thing. And it's been 6 days, yes, but I still call her BABY because names are so overrated. AND HOLY MOLY THAT STACK OF BOOKS. Insane! AND YAY NIECE! Congrats on being annnn Auntie!!!! WELL I'M REALLY HAPPY YOU STILL LOVE ME BECAUSE OTHERWISE, I'D PROBS CRY. WHO KNOWS. IT'D BE MESSY THAT'S FOR CERTAIN. I still want to read the next book though. CUZ REASONS. Grave Mercy had so much psychopathic killing. The girl was full on upset if she couldn't kill a guy. I mean, chill woman. There is more to life than mass destruction. Happy to see you have had such an amazing week. Congrats on becoming an aunt again!!!! 🙂 I’ve owned Me, Earl and the Dying Girl for far too long and now I want to read it so badly. I just watched the trailer and the movie looks incredible and like it will probably make me cry like a baby. IT'S REALLY REALLY GOOD. I couldn't wait and just read it on Sunday, like in one afternoon. It's hilarious, like absolutely HILARIOUS. Me and Earl and the Dying Girl is one of my favorite books! I read it last summer and I was laughing on the first page (and throughout most of the rest of the book). I hope you enjoy it. And The Young Elites got a movie deal too! I still haven’t read it, but it’s on my list.